"This northern warfare has been in the mountains. You don’t ride much anymore. It is walking and climbing and crawling country. The mountains aren’t big, but they are constant. They are largely treeless. They are easy to defend and bitter to take. But we are taking them." Reflecting the biases of his times, Pyle found the Japanese soldiers less than human. 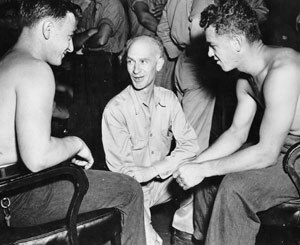 Pyle with Joe J. Ray and Charles W. Page (Navy) in the Pacific. IN THE MARIANAS – (Delayed) – Soldiers and marines have told me stories by the dozen about how tough the Japs are, yet how dumb they are; How illogical and yet how uncannily smart at times; how easy to route when disorganized, yet how brave. I’ve become more confused with each story. At the end of one evening, I said, "I can’t make head nor tail out of what you’ve told me. I’m trying to learn about the Jap soldiers, but everything you say about them seems to be inconsistent." "That’s the answer," my friends said. "They are inconsistent. They do the damndest things. But they are dangerous fighters just the same." They tell one story about a Jap officer and six men who were surrounded on a beach by a small bunch of marines. As the marines approached, they could see the Jap giving emphatic orders to his men, and then all six bent over and the officer went along the line and chopped off their heads with his sword. Then as the marines closed in, he stood knee-deep in the surf and beat his bloody sword against the water in a fierce gesture of defiance, just before they shot him. What code led the officer to kill his own men rather than let them fight to the death is something only another Jap would know. Another little story – a marine sentry walking up and down before a command post on top of a steep bluff one night heard a noise in the brush on the hillside below. He called a couple of times, got no answer, then fired an exploratory shot down into the darkness. In a moment there was a loud explosion from below. A solitary Jap hiding down there had put a hand grenade to his chest. Why he did that, instead of tossing it up over the bluff and getting himself a half-dozen Americans, is beyond an American’s comprehension. On Saipan, they tell of a Jap plane that appeared overhead one bright noonday, all alone. He obviously wasn’t a photographic plane, and they couldn’t figure out what he was doing. Then something came out of the plane, and fluttered down. It was a little paper wreath, with a long streamer to it. He had flown it all the way from Japan, and dropped it "in honor of Japan’s glorious dead" on Saipan. We shot him down in the sea a few minutes later, as he undoubtedly knew we would before he ever left Japan. The gesture is touching – but so what? I’ve talked with marines. I’ve begun to get over that creepy feeling that fighting Japs is like fighting snakes or ghosts. They are, indeed, queer, but they are people with certain tactics, and now, by much experience, our men have learned how to fight them. As far as I can see, our men are no more afraid of the Japs than they are of the Germans. They are afraid of them as a modern soldier is afraid of his foe, but not because they are slippery or rat-like, but simply because they have weapons and fire them like good, tough soldiers. And the Japs are human enough to be afraid of us exactly the same way. Some of our people over here think that, in the long run, the Japs won’t take the beating the Germans have. Others think they will, and even more. I’ve not been here long enough really to learn anything of the Jap psychology. But the Pacific war is gradually getting condensed, and consequently tougher and tougher. The closer we go to Japan itself, the harder it will be. The Japs are dangerous people and they aren’t funny when they’ve got guns in their hands. It would be tragic for us to underestimate their power to do us damage, or their will to do it. To me it looks like soul-trying days for us in the years ahead.